Evidence-based program helps people gain confidence to make changes to better manage their health conditions. 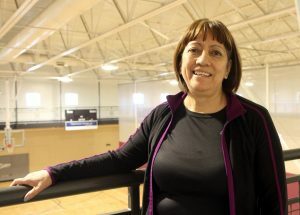 Rosa Gutierrez battled high blood pressure for eight years. But now she’s learned how to achieve small goals resulting in bigger successes. Photo by Kati Blocker, UCHealth. Six months ago, Rosa Gutierrez set three daily goals: eat more fruits and vegetables, exercise and work on her English for one hour. “Now, when I don’t do them, I feel like I’m missing something,” Rosa explained. That wasn’t always the case. Rosa never exercised and the family meals she’d prepare for her husband and three kids rarely included fruits or vegetables. She had also been battling high blood pressure for more than eight years. Then a coworker told her about Tomando Control de su Salud, one of UCHealth’s five Living Well programs. “I thought I’d see what was there and what it was like, because I care about my family,” Rosa said. Living Well is an evidence-based program to help people gain confidence to make the changes to better manage their health conditions, explained UCHealth Community Health Educator Ellen Pihlstrom, who coordinates the programs. Along with Tomando Control, the Spanish-speaking version of the chronic disease program, other Living Well programs address pain, cancer and diabetes. She committed to a free six-week program. For two and a half hours each week, she met with a group of peers who helped her set and be accountable for small goals, and provided support and guidance. 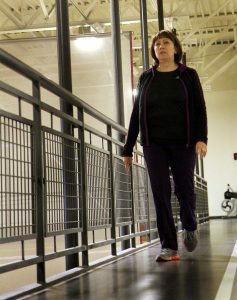 Rosa Gatierrez walks the track at the Fort Collins’ Northside Aztlan Community Center. Photo by Kati Blocker, UCHealth. Each week, participants learn new tools they can use for the rest of their lives. Learning and incorporating the seven steps to problem-solving is one example, Pihlstrom said. After learning a tool, participants create an action plan. “Action plans break down those big projects into something that’s doable so you can be successful,” Pihlstrom said. By establishing the what, how much, when and how often, participants are more likely to be more confident in their action plan. This results in higher success in achieving that plan, thus leading to subsequent successes. With the complexity surrounding disease management, this is extremely helpful, she added. Take diabetes, for example. Creating action plans to tackle little challenges is how big changes are maintained. Rosa began adding fruits and vegetables to her shopping list, which she was surprised to find out, were easier on her pocketbook than meat. She used the internet to find good recipes and then added more vegetables than required in the recipe. And she found fun ways to incorporate fruit, such as a fruit cocktail. Her husband was still a bit reluctant, she admitted. So, she found ways to “camouflage” the vegetables, like in chili. She limited meat to only a few times per week. Each week, participants report back to the class, which fosters accountability. There is a lot of sharing and brainstorming among the group, Pihlstrom explained. And that leads to support, as Rosa found out. Rosa has applied similar tools to her sleep habits and is now on a more consistent schedule and getting better sleep. And that high blood pressure? It’s under control now, too.